Our Company, Based in Oakville, Ontario, Al's Auto Repairs Inc. is your local friendly auto repair facility. We provide high quality repairs to all make and models available. 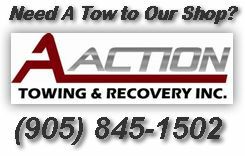 Give us a call today... We Can Help You! All of our technicians are fully trained and qualified to work on your vehicle. We adhere to the motor industry strict certifications for all our employees, keeping them up-to-date on all aspects of repair standards. Estimates are provided to give you a clear and precise information of what is required to keep you on the road. All repairs are fully guaranteed for parts and workmanship. All Makes and models are welcomed for repairs. We have all the latest testing and diagnosis equipment available, for quick and efficient repairs.